I've had my LB Premiere II for a couple of years now. It's always been difficult to re-assemble, as it was always hard to get the slide stop pin where it belongs. No matter what I did, I couldn't get the slide stop to go all the way in. I figured it might have been me struggling to hold all the parts properly aligned, so I took it all apart and tried to assemble the gun the old way with the spring "loose". Once the pin was in, I was going to lock the bushing in place. No go. Same problem. The slide stop only goes so far into the gun. 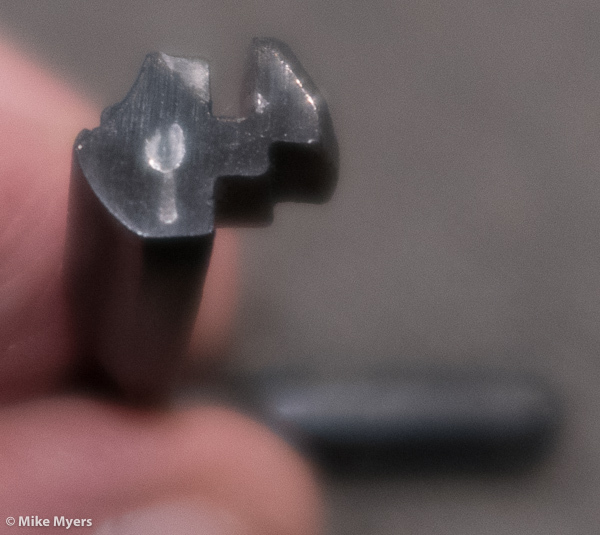 To make this a bit easier to do, I've always had to use a Pachmayr "Widget" to depress the locking ball just slightly, so it would allow the pin to go into place when I pushed it up and in. I've probably done this a dozen times tonight. I've been SO tempted to use a plastic hammer to tap on it, but that shouldn't be necessary. Also - is this a custom made part, or can I just order a replacement? I plan to do one of these - or just take the slide stop to a gunsmith... or study it for a while until I'm certain of what to do, and where to do it. To help with learning the secret handshake you could try practicing without having the recoil spring in the gun to remove one item to coordinate. What you wrote, is what I did, and once I learned it, things got SO much easier. Buy about 3 or so Widget tools from Midway, you will pay only one shipping charge and have spares. I did about 15 years ago and wish I had 40 years ago. If you need to be shown how to use the Widget I could show you how to use it in Feb. I'd love to see how you do it. I found one way, and while it works, maybe there are better ways. I just put the thin part of the blade against the plunger, and push it in a bit, then while it is pushed in, move the slide stop up just enough to hold it in. Then, with two thumbs pushing what I think is normally, the slide stop snaps right in. Yep, I did buy more than one, and gave away all but one. I should get a few more. Just got a pistol back from Clark Guns, and it was like I have never taken one apart before. They did a nice job on it considering I didn't give them much to work with. The barrel, bushing and slide fit are real nice, but fairly difficult to get apart and back together. I guess the looseness in my other guns equates to easier disassembly. Alex, did you try to get the slide stop in place with none of the other parts assembled, just the slide and receiver? That's the only "Secret Handshake" I know. Does the slide stop go in and out easily while it is rotated straight down so you're not dealing with the plunger at all? No problem with the slide stop. Just need to hold my mouth right. Shorten or reshape the end of the plunger. File a slope on the stop to let the plunger slide by. I have also read of using a long slender drill bit through the plunger tube to locate and make a better indent for the plunger in the stop's down position. Tapering out of the indent might be needed.